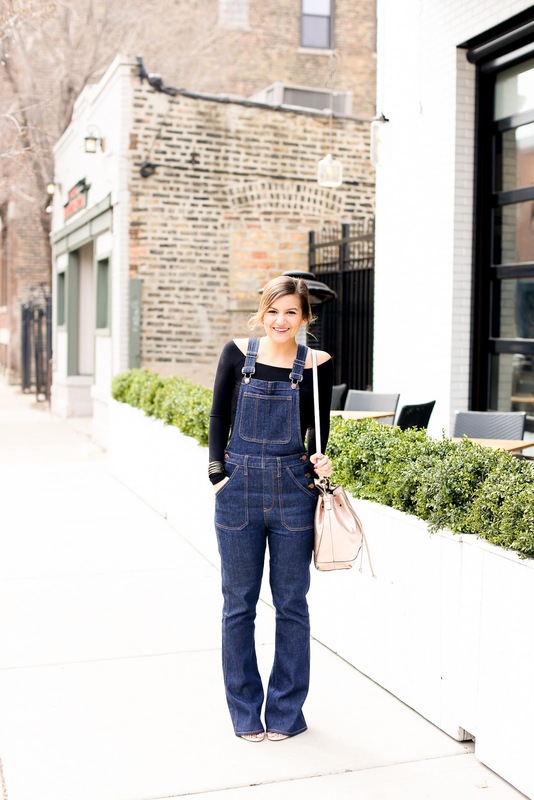 It’s no secret that I’m totally on board with the overalls trend. I styled a black pair back in September… but they weren’t mine to keep. (Thanks for lending them to me, Ali B!) Needless to say, when I saw this pair at Madewell on sale, I KNEW it was time for me to own my own pair. After posting this sneak peak on Instagram, it’s obvious you guys agree with me. No buyers remorse here, baby!! You guys are the best! I especially love this cute top with overalls because it adds a little bit of sexiness to an otherwise somewhat unsexy trend haha Let’s be real, no one wants to look like the 7 year old version of themselves!! It’s also a crop top, which helps avoid bulk around the midsection that can mess with the proportions. No frumpiness here – we all want to look flirty and fun, right?! I finished the look with my favorite bucket bag by Rebecca Minkoff. This little guy fits so much more than you’d think – my DSLR even fits in there! If you follow me on snapchat (username: lakeshorelady), you might have seen some of the gorgeous decor… and my avo toast 🙂 Seriously, everything was SO cute. Plus, Hush Puppies was generous enough to let us pick out a pair of shoes, and these booties came home with me! I posted a sneak peek yesterday, but a full outfit post with them is coming soon! 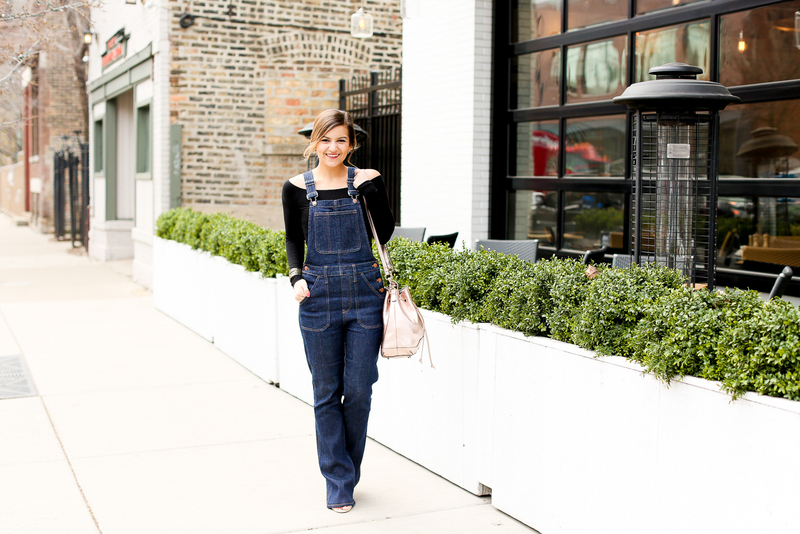 Seriously, don’t we all need overalls?! Right?! Thanks again to Kelly for snapping these photos for me!! Lauren, this was the cutest look at the brunch! LOVE these overalls on you! Thanks Heidi! Hope to see you again soon! I love the wide leg on these, too! They're super retro this way – plus it requires a heel for me, which makes the look feel more pulled together. Love this off the shoulder trend on you. Cute! Love this look Lauren!! 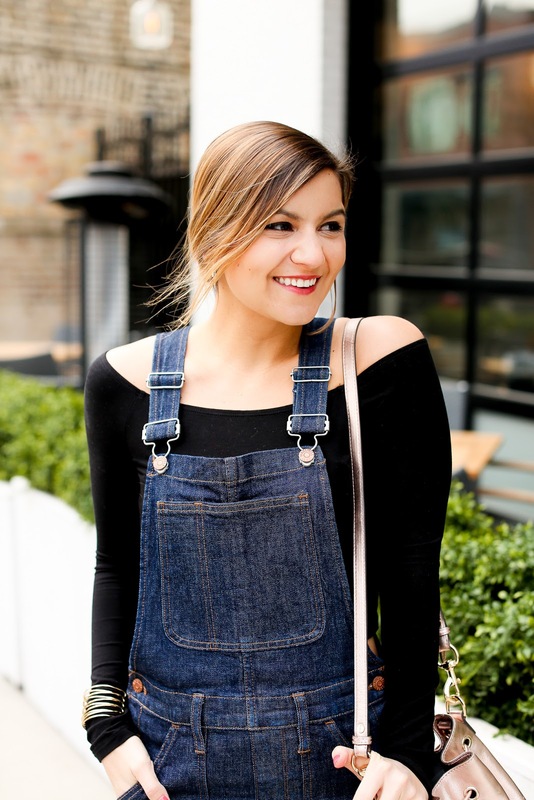 the off the shoulder with the overalls is such a cute mix!